Last night there was a cool breeze coming in over the audience in Central Park's Delacorte Theatre and a full moon rose in the clear Manhattan sky. 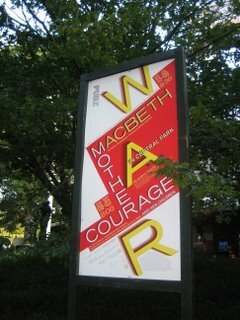 It was the perfect setting for the first preview of Berthold Brecht's Mother Courage and Her Children. Tony Kushner, Tony and Pulitzer Prize winning playwright of Angels in America and Caroline, Or Change, translated and updated Brecht's work from German. Jeanine Tesori wrote new songs for piece. George C. Wolfe directed. Meryl Streep, Kevin Kline and Austin Pendleton starred. 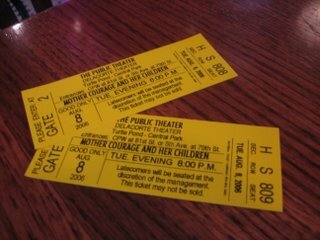 My friend Noah's friend Bruce Coughlin, the Tony winning orchestrator, provided tickets for us. Oh, how lucky I am to know a Broadway insider. It was indeed good to avoid the long, long linesin Central Park for free tickets; some waited overnight in hopes of nabbing tickets. They will do it again today and until September 3rd. Berthold Brecht is known for his dark work that is heavy in political satire. He wrote the book for ThreePenny Opera which I saw earlier this summer. Like ThreePenny, it was dark and disturbing, although not quite the shocking and messy train wreck. Still, I couldn't look away. It's about a long war in the 1600's in which a woman named Courage profits from the war but also loses her three children to it. I understood the point to be that nobody really wants peace as there is no profit in peace, no matter the losses you suffer in war. It is very wordy with moments of shocking sadness, however it was not without it's funny moments as well. Austin Pendleton and Kevin Kline provided the brief comedic respites, although Meryl's often dry delivery brought laughter at times. Kevin Kline has little stage time, although he does have one song to perform. It's almost all Meryl, as it should be, of course. She's definitely an actor who sings – she doesn't have a gorgeous voice, but one that conveys what it needs to. Her delivery is thoughtful and powerful. Her voice brings shivers. At times I could hardly believe I was hearing her voice live. I kept watching her mouth, trying to convince myself that the voice I heard from the speakers was coming from her. Her energy is astounding and she makes the whole thing look effortless. The performance was exhausting, starting about 8:00 and ending after 11:00 with just one 15 minute intermission. I'm glad I saw it, but it is definitely not the light fare and I have no plans to see this one again. I am sure it won't be my last Brecht piece though. Great post. I read "Mother Courage" a few years ago, and I think you summarize its main theme very accurately. I wish I could see this.